BORP Power Soccer is happy to announce that we will host 2 Power Soccer Clinics for Children and Youth (ages 8-18) this summer. The clinics will provide games, activities and trainings designed to meet all levels of experience from rookie to expert. The clinics will be held on July 16 and August 13 from 2:00-7:00 PM at the James Kenney Recreation Center, 1720 8th Str., Berkeley. Participants may attend one or both clinics. Necessary equipment (other than power wheelchair) will be supplied. Players who have their own foot guards should bring them if possible. There is no charge to participate (but donations are welcome). Please help spread the word by passing on the attached flier and contact me if you have any questions and/or to register. Ruby Shemaria taking a shot. Since some of you don’t get to witness the impact of our programs I wanted to share this with all of you. 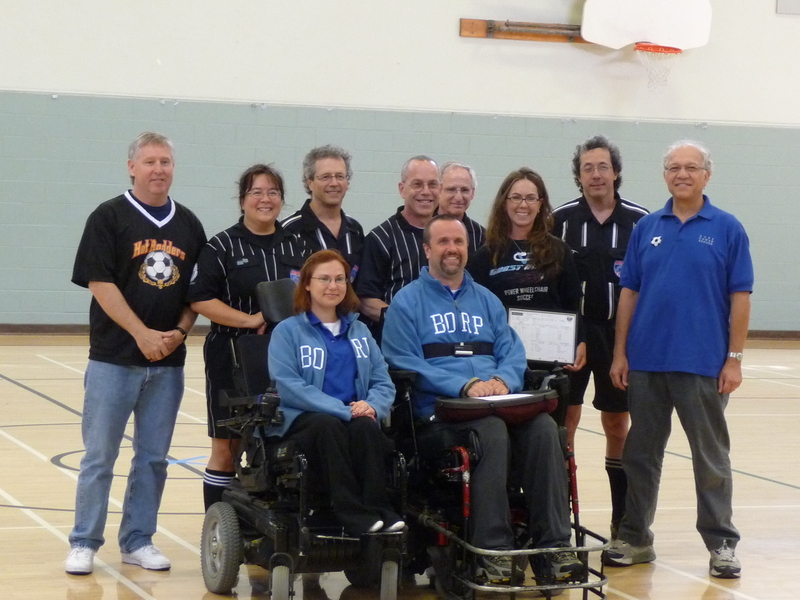 In preparation for the 2011 World Cup in Paris the defending champion USA Power Soccer Team will be having a training camp in Berkeley on May 27-29 at the James Kenney Recreation Center, 1720 8th Street. BORP’s Head Coach Chris Finn is the Head Coach of Team USA and was also the Head Coach during the 2007 championship campaign. BORP Bay Earthquake, Kendra Scalia-Carrow, is a player on Team USA and BORP’s Adult Sports Program Coordinator, Jonathan Newman is on the Team USA staff. The public is invited to watch Team USA in action during Training Camp exhibition games on May 29 from 1-5 against a Northern California All Star Team. Please help spread the word and then come out and support Team USA as they get ready to take on the world! Click below for a pdf of the flyer. I want to thank everyone for an amazing event this weekend. I would have to say that this was one of the best Roll n Shoot events that I have seen. Once again, congratulations to the Thespians for another championship effort. They may not be great athletes, but they act like it. I also want to say thanks to all the kids that coached the teams during the event. It is so much fun watching the BORP athletes teach the sport, motivate their teams, and pass on the information that they have learned over the years. Listening to Isaiah after each game was great. He replayed almost every point with such excitement. I also got a kick out of Jesus telling me how Daniel Diana was a really good coach. Marquis was so excited to be coaching with James again, and to be working with the team from Children’s Hospital. However… The highlight of the day must go to Reajean. Not only did she get so excited about every point of every game, not only did she yell and scream out instructions constantly, but during the semi-final game when her team hit a 3-point shot at the buzzer to advance to the finals – She actually jumped higher than anyone has ever jumped in the world before. I can only hope that Scot got that moment on film. Again, thank you to everyone involved. From Samantha organizing the event, to Kaila and the rest of the parents getting the food, and to all of you that put the word out to get teams registered. This event was simply amazing. Next up – Anne has lined up a concert next weekend. This is a family friendly event benefiting BORP so all kids are invited. Click on the link below to see the flyer. One year Lori Gray organized a trip to Coyote Hills; it was amazing! Coyote Hills had paved trails along its golden rolling hills overlooking vistas of marshland. It was like looking down onto someone’s quilt work, patches of beige, brown, and rust. I believe the patches of color were beds of salt and mineral. When our trail hike ended, I rolled my power wheelchair down to the water’s edge. There, I was further invited to traverse the marsh on a meandering wooden pathway with lush cattails on either side. It was an amazing feeling to witness a Muskrat forage for its food and find myself among the olive green reeds. I knew a Muskrat foraging in the afternoon was a rare to see because they usually forage at dusk and dawn. As I continued on my path, Nature beckoned me to look up and watch a flock of Red-Winged Blackbirds in the sky. The flock formed a black wave that looked like a sail being pulled taut along its mast. Little by little, the blackbirds would swoop down into the reeds to roost; they chirped happily as if they were welcoming me to their home. These beautiful little birds flashed their black iridescent bodies and their brilliant red stained wings in the sunshine as they landed. I felt as if I were secretly witnessing the filming of a documentary on marsh life. Unfortunately, I soon found myself back at the beginning of my marshland adventure. When I reached the paved trail my heart was warm and tranquil. I wasn’t ready to go home, but, was most grateful to witness Nature at her best — an opportunity I would have never dreamed. The Bombers faced off against the Crushers on April 17, facing a crushing 8-1 defeat. Brian Larson scored early on with an unassisted goal, winning a battle against Bombers defender Eddie Contreras and beating out keeper Luis Campos. April Bryant put one in off a corner kick and the Crushers took an early 2-0 lead. The Crushers then scored three more goals in quick succession, two by veteran player Margaret Mele and another score by Brian Larson. The second half opened with yet another goal by red hot Larson but the Bombers found an opening five minutes into the second half when Milo Balcziunas blasted a shot in off a pass by Jessica Roeckl-Navazio. Further offensive attempts by Bomber players Emil Perry, Alexa McBride, Ruby Shemaria and Chanelle Stallmeyer were shut down by Miranda Green, Stephen Dykstra and Thalia Geleibter. The game ended with two more goals for the Crushers, one by Stephen Dykstra and a third goal in the game by Mele. Bomber keeper Luis Campos and defender Milo Balcziunas are ready to defend against the Crusher’s onslaught led by Brian Larson. Both teams came back out after the halftime break ready to rock! After 8 minutes of shots being fired at both goals Brett McCollough managed to breakaway and score the Ghostrider’s third goal unassisted. Tim McPheeters had another goal to put the Ghostriderz ahead 4-0 and McCollough scored again in the final seconds of the match to make it 5-0 Ghostriders. Ghostrider Tim McPheeters and Bomber Emile Perry battle for control in the second half. The final games of the regular season are being played May 21 and 22 in Alviso. Many players will be getting ready to compete at the State and National Levels and to train for the National Team. Special thanks to the coaches, referees and volunteers who help make it happen. 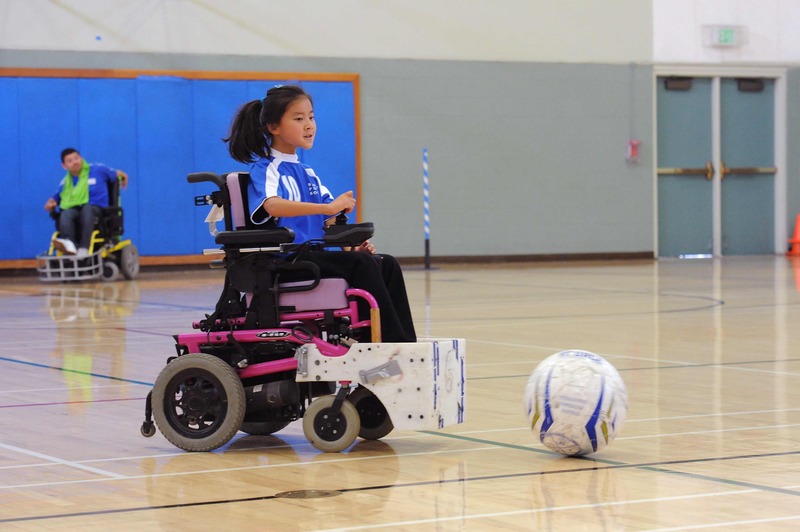 Best of luck to all of our power soccer athletes and Go BORP Power Soccer Teams!! !